I have that U2 song “Lemon” stuck in my head, from the band’s 1993 album Zooropa. Well, I’m sorry to be the one to tell you this, but that was twenty years ago. We’re old. And we misspent our youth. Ok so much updating is in order. It’s been six weeks since my last post—the longest dry spell since I started this blog almost two years ago. What happened? December holiday madness. Office parties. Book deadlines. Dating. Etc. And then, on December 22nd, I suffered a concussion after fainting in the Whitney Museum, crashing hard on Marcel Breuer’s concrete floor, my head breaking my fall. I was at the Wade Guyton show on the third floor, which you should go see if you’re in New York, it comes down on Sunday. Go for the Guyton, stay for the Artschwager. I’ve been largely out of commission for the past two and a half weeks. Not cooking, not biking, not yoga’ing, not working. 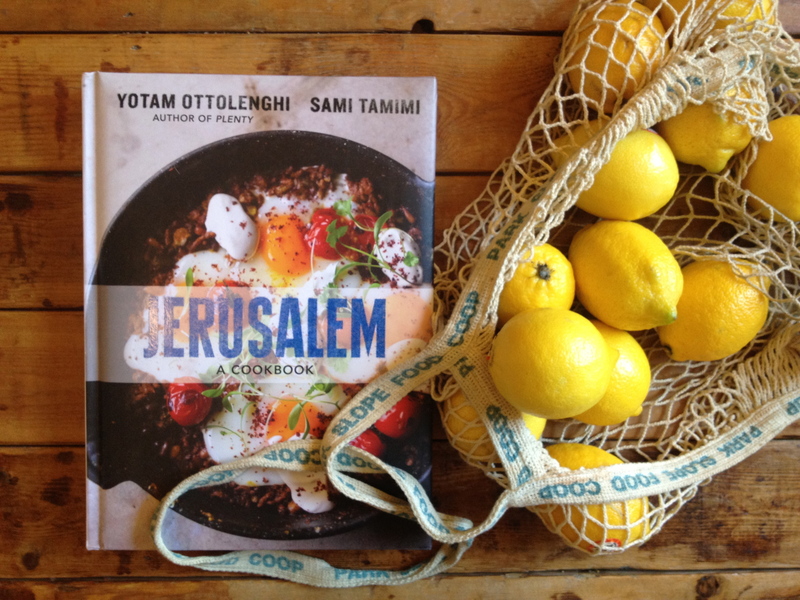 For Christmas I received two copies of Yotam Ottolenghi’s new cookbook Jerusalem. One from my sister Hope, the other from the b.f. Melony. I’m exchanging one of them for Plenty, since I miss having Mark’s copy around. So while I haven’t been at the stove, I’ve been curled up in bed with the beautiful book designed by Sarah Pulver (cover for U.S. edition) and Here Design (interior and cover for UK edition), dreaming of shakshuka, mejadra, and eggplant everything. But I thought I’d take it slow and begin my re-entry with something not too labor intensive but with big results: preserved lemons. On the few occasions I’ve had the store-bought kind in a jar I’ve enjoyed the fragrant sweet-sour tastes with couscous, bulgur, fish, lentils, meat. But never having made my own, it seemed about time to dive in. This is also strategic: I plan to cook my way through this book over the coming months and having these luscious preserved lemons on hand four weeks from now will come in handy for multiple recipes. Now, a head’s up: you make these lemons in stages. So first you stuff with salt and keep them sealed in a mason jar for a week. Then at that point you open the jar and stuff them with rosemary, chile, lemon juice, and olive oil, then let sit again for at least four weeks. I just began step one, but couldn’t wait to post about it. So I haven’t even added the rosemary, etc. yet. I’ll update here when that happens in about a week’s time. Make sure you have a Ball or Mason jar large enough to accommodate your lemons. Sterilize it by filling with boiling water, leaving for a minute, then emptying. Let it air dry. Wash the lemons and cut a deep X or cross down through the lemon, leaving about 3/4 in. from the bottom. 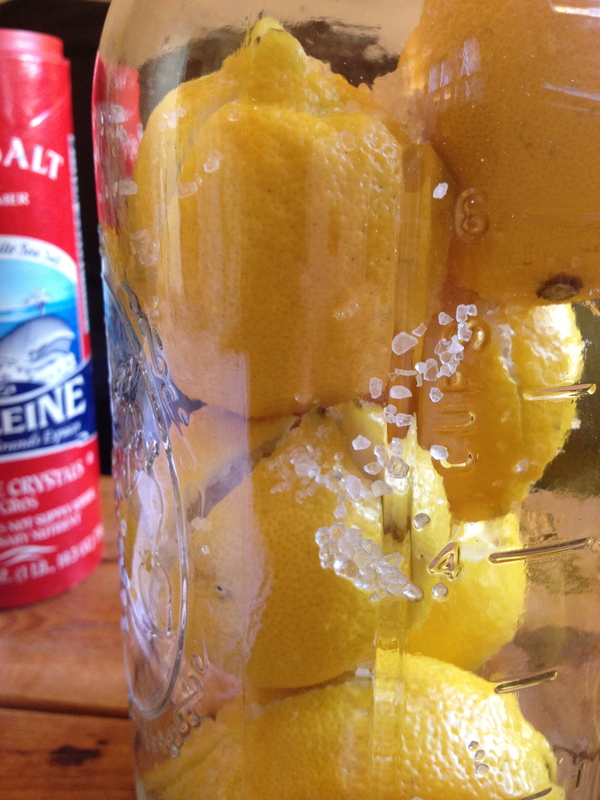 Stuff each lemon with 1 tbsp of the salt and place in the jar. Push the lemons in tightly, seal the jar, and leave in a cool place for at least one week. If you don’t know how to seal a jar properly, here is one of many links that explains how to do this. After this initial period, remove the lid and press the lemons as hard as you can to squeeze out as much of the juice as possible. 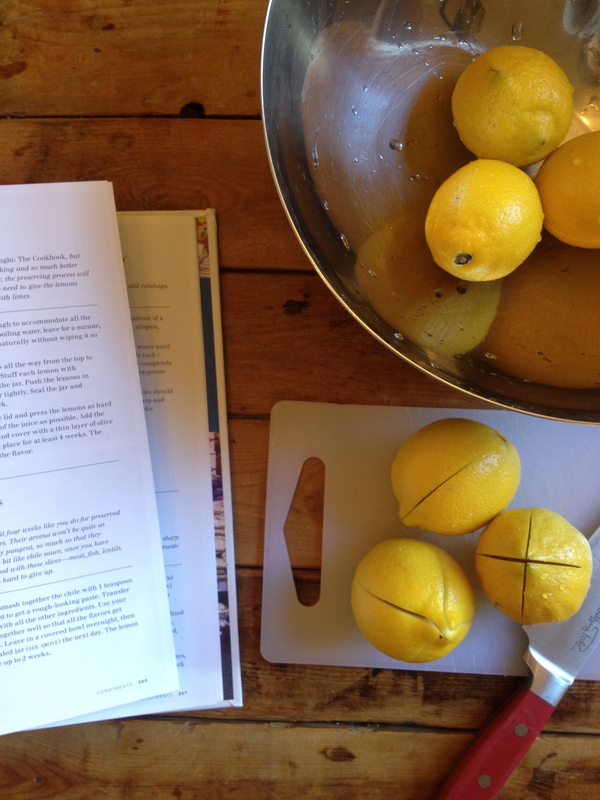 Add the rosemary, chile, and lemon juice, and coat the lemons with a thin layer of olive oil. Seal the jar again and leave in a cool place for at least 4 weeks. The longer you leave them the better the flavor. Enjoy these as a condiment to many meat, fish, and vegetable dishes. 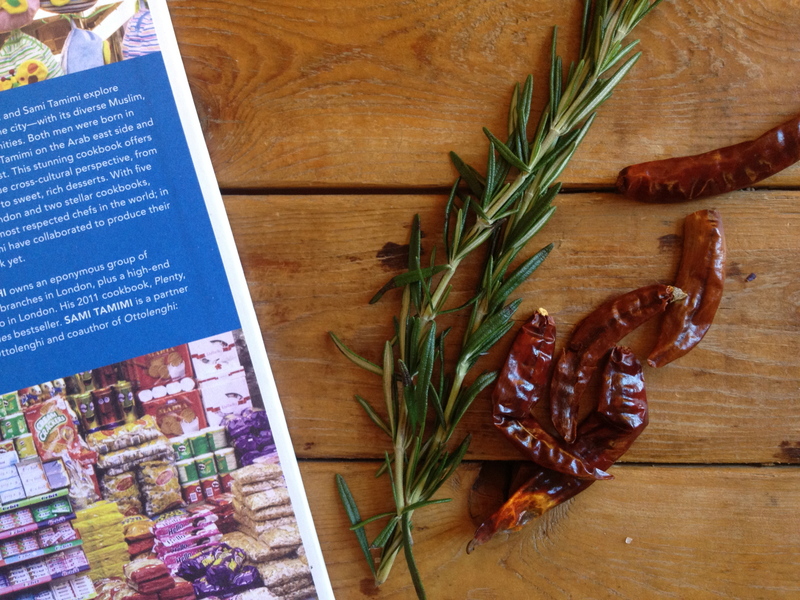 I’m planning to use mine in the recipe for Chermoula eggplant with bulgur and yogurt, from the same book. Glad you are posting again!! I hope you are feeling ok!! How are you? better today, thanks kf. i think key is not doing too much. preserving lemons is about my speed.